Marshall linebacker Omari Cobb (31) hits Old Dominion quarterback Steven Williams (14) during Saturday’s Conference USA football game at Joan C. Edwards Stadium in Huntington, W.Va. Both teams battled through a scoreless first quarter, but the Monarchs (2-4, 0-2) struck first on the scoreboard as Nick Rice completed a 10-play, 65-yard drive with a successful 24-yard field goal at the 8:47 mark for an early three-point cushion. MU had a Kaare Vedvik 27-yard field goal blocked on its ensuing possession, but the defense forced a punt that gave the hosts the ball back at Marshall 24 with 3:39 remaining before halftime. Facing a second-and-goal at the ODU two, Chase Litton lobbed a pass to the back left corner of the end zone for Tyre Brady — who hauled in the contested spiral while managing to get a foot down in bounds. The Litton-to-Brady connection capped a six-play, 76-yard drive that gave Marshall a permanent lead of 7-3 with just 49 seconds left in the first half. Old Dominion claimed a 10-8 edge in first downs and outgained the Herd by a 152-131 overall margin in total yards during the first half, though the guests did commit the only turnover in the opening 30 minutes after C.J. Reavis came up with an interception on a deflected pass on the opening drive of the game. Both teams traded punts to start the second half, then Marshall added to its lead after stringing together a six-play, 54-yard scoring drive that ended with a 30-yard Tyler King touchdown run. Vedvik added his second of five successful PAT boots, giving the Herd a 14-3 edge with 9:50 remaining in the third. Both teams traded punts on the next five possessions, which led to MU taking over at its own 37 with 1:24 left in the stanza. The Green and White put together six-play, 53-yard drive that ended in points as Litton found Brady on a 46-yard bomb down the left sideline that gave Marshall a 21-3 cushion with 14:16 remaining in the game. On the ensuing kickoff, Isaiah Harper fumbled his return attempt — and Chris Jackson scooped up the loose ball and rumbled 15 yards to paydirt while giving the hosts a 28-3 cushion with 14:09 left in regulation. The Herd forced another punt on Old Dominion’s next possession, then capped things off with a four-play, 37-yard drive that ended with a 31-yard touchdown pass from Litton to Ryan Yurachek — making it a 35-3 contest with 10:49 left to play. Marshall also put together a nine-play drive over the final 6:17 of regulation to run out the clock and wrap up the 32-point triumph. The Monarchs had possession of the football for 29:30 of the 60-minute affair, but eight of their 13 offensive drives resulted in punts. MU, conversely, punted only six times in 13 offensive possessions. The hosts claimed an 18-13 advantage in first downs and also finished the day plus-2 in turnover differential. The Green and White also outgained ODU by a sizable 371-197 margin in total yards of offense. Following another dominant performance by his troops, MU coach Doc Holliday had plenty of kudos to pass around after the game. The Thundering Herd allowed a single sack in the victory, just the third sack allowed by the offensive unit this fall. ODU entered the game with 19 QB sacks through five games defensively. 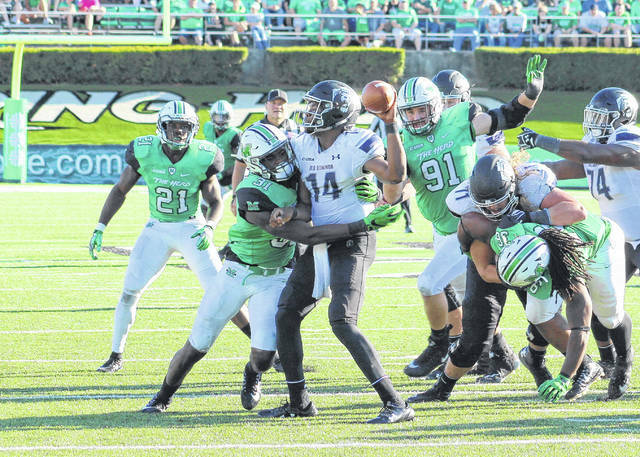 Marshall, conversely, came away with three three sacks on Saturday and now has 18 QB takedowns on the season. The Herd produced 195 rushing yards on 40 carries, with King leading the way with 77 yards and a TD on 13 attempts. Keion Davis also added 73 rushing yards on 16 tries, while Anthony Anderson tacked on 46 yards on seven totes. Litton finished the game 12-of-23 passing for 176 yards, throwing three scores and zero interceptions. Litton has now thrown 112 consecutive passes without an interception. Brady led the MU wideouts with five catches and two scores on five grabs, followed by Yurachek with 44 yards and a score on four grabs. Malik Gant and Chase Hancock led the defense with 10 tackles apiece. Omari Cobb, Frankie Hernandez and Channing Hames each recorded a sack in the win, and the hosts also had 10 tackles for loss. ODU — which finished the game 4-of-15 on third-down conversions — produced only 81 rushing yards on 36 carries, an average of 2.2 yards per attempt. Jeremy Cox led the Monarchs with 52 rushing yards on 15 tries, while Ray Lawry added 40 yards on 14 attempts. Steven Williams finished the day 14-of-27 passing for 116 yards, throwing one pick and zero touchdown passes. Melvin Vaughn led the ODU wideouts with 55 yards on five catches. Marvin Branch led the visiting defense with 14 tackles. Oshane Ximines recorded the lone sack for ODU, which also logged five tackles for loss. 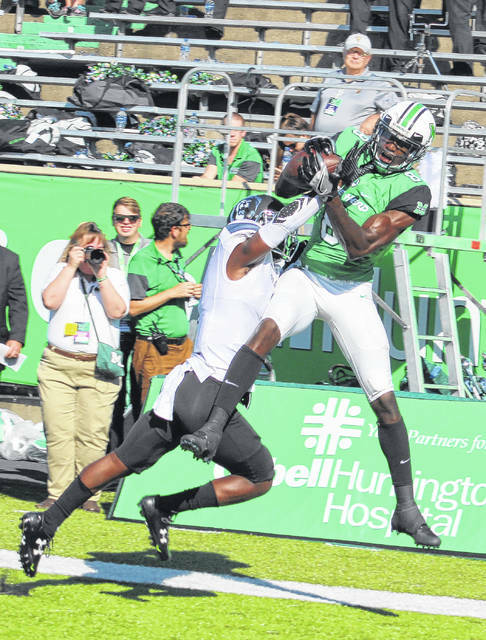 The Thundering Herd — who are 2-0 in conference play for the fourth time in eight years under Holliday — return to action Friday when they travel to the Volunteer State for a 7 p.m. contest against Middle Tennessee. NOTE: Vedvik set both a program and a Conference USA record with a 92-yard punt in the first quarter, which ended up resulting in a touchback for a net of 72 yards. The previous Marshall record was 79 yards set by John Arnold against Temple back in 1974.